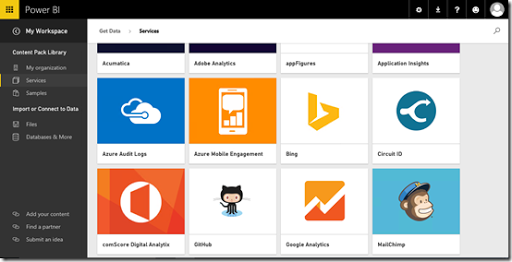 Power BI is a free (yes the basic offering is free) tool from Microsoft that allows you to analyse and report on data from all sorts of sources. You can upload your own spreadsheet for analysis and you can use the built in contents packs as you see above. 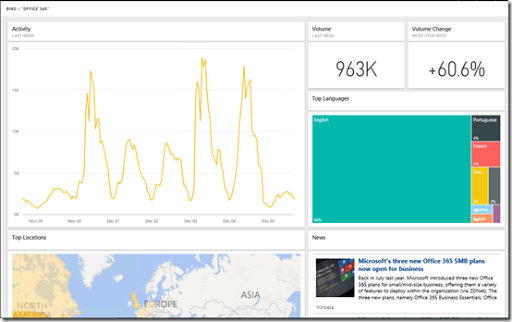 Microsoft has just release the Bing content pack for Power BI allowing you to analyse search terms. 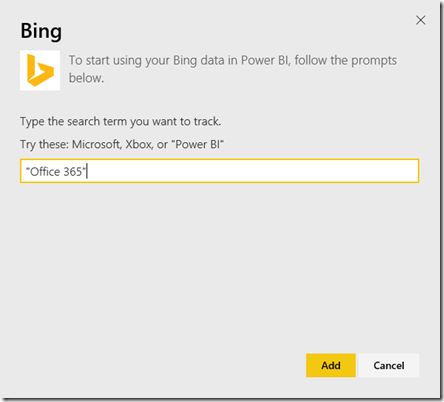 To configure, all you need to do is all the Bing content pack from the Data Sources option. You’ll then need to enter a search term you wish to track (here “Office 365”. Then you’ll get a dashboard you can start configuring. The only limitation at the moment for the Bing Content Pack is that it doesn’t support the natural language query that the other content packs do. Hopefully, that feature will be coming in the future because that would really be a killer addition. and sign for a free account and start making your data visual.